3.5″ or 2.5″ drive mounted in the front. Tool-less screws for easy HDD mounting. 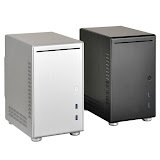 Up to two 2.5″ drives.HDD tray can be removed to make more room for 3.5″ drive or 120mm fan.